A purpose built area designed to welcome visitors to Church Farm. 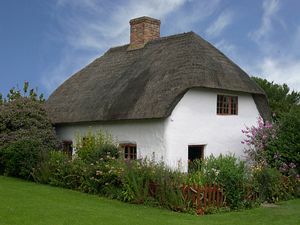 A wonderful example of a Lincolnshire "mud and Stud" thatched cottage. It was moved from the nearby village of Withern, re-erected on site and opened in 1982. It is simply furnished to give an insight to the living conditions of an agricultural labourer in the late eighteenth century. The well established garden is stocked with traditional shrubs and flowers. Imagine the sight and sound of cows as you enter this building which houses fascinating displays of implements and machinery relating to Lincolnshire longwool Sheep, Curly Coat Pig and Red Poll Cattle. At one time, horses provided much of the power on a farm. Tack, straw and the smell of leather evoke a vivid picture of those heavy horses on the land. Across the yard, step inside the Farmhouse. The building is dated around 1760 with 19th century additions. It has been furnished to the period 1900-1910. The kitchen retains a working coal fire range where baking is regularly demonstrated. Rooms such the pantry, parlour, nursery and bedroom are set out as if the occupier has just stepped outside for a moment. It all contributes towards that "lived-in" feeling that makes visitors feel so at home when they explore Church Farm. On leaving the farmhouse and heading towards the pond and orchard, call in at the Wash-house. Dolly tubs, mangles, irons.. Reminders of washday before the automatic washing machine! A variety of traditional Lincolnshire apple trees populate this area. Herbs and ground cover plants hug the front garden of the farmhouse. At the bottom of the Orchard nestles an octagonal Summerhouse. It started life as a small Pavilion at Skegness Cricket Ground but now attractively blends in as a convenient rest area. Leaving the orchard beside the pond, to the right are a number village workshops relating to the blacksmith, wheelwright, plumber/tinsmith. The forge is often brought to life during the season and workshop displays feature examples of tools used in each of the trades. This timber framed building is the latest addition to the Church Farm Museum complex. It was dismantled and moved from its previous site at nearby Welton le Marsh, to be re-erected here. 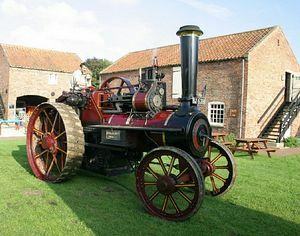 It was first opened to the public in March 1998, and now houses a Hornsby Traction Engine and Threshing Drum. Retracing the route leads to the entrance of this magnificent brick barn and adjacent Wagon Hovel. Wheeled farm vehicles can be seen sheltering in the Hovel. Stairs leading up from ground level climb towards an education room available to school groups. Havenhouse barn itself has two floors. Upstairs is a temporary exhibition gallery which hosts a variety of different exhibitions, ensuring there is always something new to experience. Downstairs is set aside as a refreshment area, where light snacks are prepared and served by the Friends of Church Farm Museum. Complete the trail by returning to the shop to purchase a gift or souvenir of your visit. On entering the town of Skegness, whether from the A158(Lincoln), A52(Boston), or A52(Grimsby), follow the brown museum signs which will direct you to the Museum, just 1/2 mile from the town centre. Bus Service: SB2 & SB3 Super Buzz routes.